One of the first blogs I started following was The Pioneer Woman. City-turns-country girl had an interesting perspective on things and her recipes were easy and sounded delicious. One of the first recipes I tried was the BBQ Comfort Meatball. Recipe here. My kids love this, my husband is thrilled when he knows I'm making it, and my friends crave it every now and then. With Bahrain's temperature slowly dropping, it is the perfect time to make it. 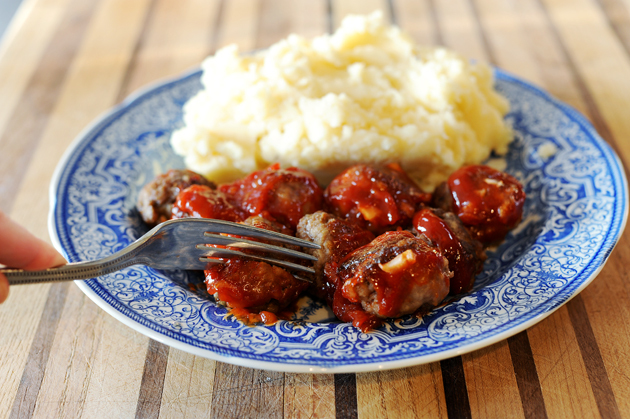 I use lean beef (Geant or Lulu) and also, if you want to make it ahead (it does stink up your hair), you can fry the meatballs and set them aside, before baking slather the sauce and pop it in the oven. 1 dash Tabasco (I use Jalapeno - refrain if for kids). 2. Combine all meatball ingredients. Roll into medium-small balls and place on a cookie sheet. Place sheet in freezer for five minutes. 3. After 5 minutes, remove meatballs from freezer and immediately dredge in unseasoned flour. 4. Brown meatballs in canola oil until just brown. Place into a baking dish. 5. Combine all sauce ingredients. Pour over meatballs and bake at 350 degrees for 45 minutes. I serve them with brown rice and garlic bread. Mashed potatoes are a sinfully delicious replacement to the rice. I agree. One of the best recipes I've ever cooked! Latifah - you will thank me when you make this. It is such a comfort food and goes well with any side dish you like. Enjoy!